Upon his graduation from West Point in 1967, Colonel Mullane was commissioned in the United States Air Force and completed 134 combat missions in Vietnam. He holds a Master's of Science Degree in Aeronautical Engineering from the Air Force Institute of Technology and is also a graduate of the Air Force Flight Test Engineer School at Edwards Air Force Base, California. 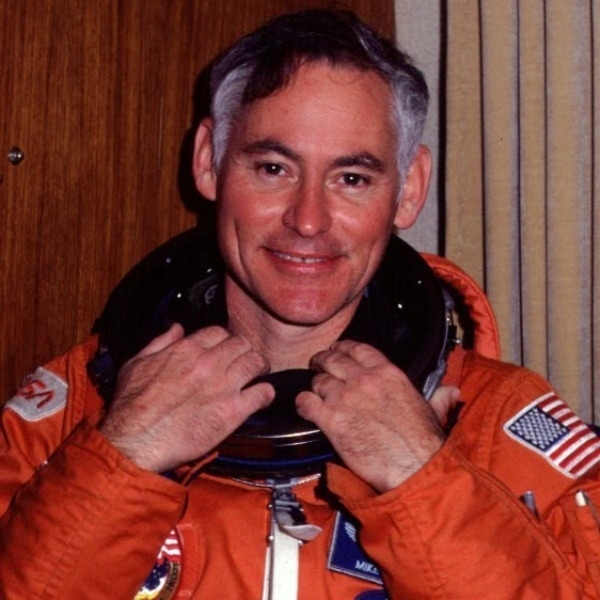 Mullane was selected as a Mission Specialist in 1978 in the first group of Space Shuttle Astronauts. He completed three space missions before retiring from NASA and the Air Force in 1990. Colonel Mullane's recently published memoir, Riding Rockets: The Outrageous Tales of a Space Shuttle Astronaut, (Scribner), has been reviewed in the New York Times and on the Jon Stewart Daily Show. 1. Guarding against a "Normalization of Deviance"
Mullane uses the Challenger tragedy to make this point. Under tremendous schedule and budget pressures and over multiple launches, the NASA team accepted a lower standard of performance on the solid rocket booster O-rings until that lower standard became the "norm". By the dawn of Challenger, the NASA team had become so comfortable with seeing occasional O-ring damage and getting away with it, the original standard, in which ANY O-ring damage was defined as intolerable deviance, was marginalized. A “predictable surprise”, i.e., a deadly disaster resulted. See the magazine article, “Normalization of Deviance”, authored by Mullane (below). The power of all teams resides in the uniqueness of the team members, in their diversity of life experiences which yields a diversity of insights into team situations. When individuals become “passengers” and don't put their unique perspectives on the table for the team and leadership to consider, the team will suffer. Mullane uses a personal experience to drive home the dangers of becoming a “passenger”. As a new crewmember in a 2-place fighter jet, he noted a safety situation but assumed the experienced pilot in command knew what he was doing when he continued with the mission. Ultimately Mullane and the pilot had to eject from the crashing plane. Having narrowly escaped death because of it, Mullane is intimately familiar with the dangers of team members slipping into a “passenger” mode. "One person with courage forms a majority", is a quote by former President Andrew Jackson that Mullane will use in this discussion. Mullane closes this discussion with a real world example of how a medical doctor at NASA (not an engineer or astronaut) had the best idea for a shuttle bailout system. This is an example of how great ideas can exist in the minds of people who are not considered the experts on a particular issue. Most audiences are shocked to learn how ordinary Mullane was. People assume because he is an astronaut now, that in his youth, he was a super-child, destined for great success. That is not the case. Mullane uses slides and video to prove he wasn't a child genius. He wasn't a sports star. He wasn't popular. He didn't date the homecoming queen. Yet he realized a lifetime dream through the practice of self-leadership. Every individual and team has an “edge of a performance envelope”. That edge is much further out than individuals and teams realize and they find it through the practice of self-leadership. Countdown To Teamwork is remarkably insightful, inspirational and humorous. The audience will come away from the program with a renewed sense of their potential and the potential of their teams. Normalization of Deviance, by Astronaut Mike Mullane. Astronaut Mike Mullane is a veteran of three space shuttle missions. His recently published memoir, Riding Rockets, The Outrageous Tales of a Space Shuttle Astronaut (Scribner), deals significantly with his time at NASA and the Challenger disaster. Copyright 2007 by Mike Mullane. This article cannot be reprinted in other publications without the written permission of the author. On the morning of August 30, 1984 I was scared. Terrified, really. I was strapped into the cockpit of the space shuttle Discovery, minutes from my first flight into space. Most of the public would have been surprised to hear of my fear. For the past two years, since the fourth shuttle mission had landed, NASA Headquarters had been telling the media that the shuttle was no longer “experimental” but rather “operational,” a title that implied the machine was nothing more than a very high flying 747. The public had been lulled into believing the great risks of spaceflight were a thing of the past. Fear in the cockpit? They wouldn't have believed it. But I was a former Air Force flyer with 1500 hours in the back seat of the F-4 Phantom. In my 10 year flying career, I had read the accident reports of countless military jet crashes and had buried a number of friends who had died in some of those crashes. If we couldn't build flawless jets, I reasoned, how much more difficult must it be to build a flawless spacecraft of the complexity of a space shuttle? In spite of NASA Headquarters pronouncements about the shuttle being “operational,” I was scared. At T-6 seconds the three space shuttle main engines (SSMEs) were commanded on by computers. The cockpit was violently shuddered. Nearly 1.5 million pounds of thrust was tethered to earth by explosive bolts. Only if the ship's computers determined the engines were operating nominally would those bolts be blown and the command issued to ignite the twin solid-fueled rocket boosters (SRBs). 3…2…1…. The SSME health check was nominal. A new violence of noise and vibration swept over us as the SRBs fired and Discovery leaped from the earth on 7.5 million pounds of thrust. I watched shadows move across the cockpit as Discovery pirouetted in a “Roll Program” and began a slow pitch-over toward the risen sun. A minute into flight the cockpit was rattled with a new wave of brutal vibrations, this time from the sonic waves being generated by flight through the sound barrier. At about 25 miles altitude, there was a loud “bang” in the cockpit and a whip of fire across the windows as the expended SRBs were jettisoned. They would parachute into the Atlantic and be retrieved by tug boats to be used again. Now, only the liquid-fueled SSMEs were running. They had to perform perfectly for the next 6 ½ minutes to get us to our final orbit altitude of about 250 miles and a speed approaching 5 miles per second. I prayed they would do so. It was these engines that astronauts most feared. Each consumed 500 pounds of propellant per second. The turbo-pumps that rammed this fuel into the combustion chambers ran at hellish pressures, temperatures and RPMs. Continuous helium purges were needed to keep dangerous gases from mixing and causing an explosion. Countless welds in a maze of tubing had to withstand temperatures that varied from cryogenic cold to thousands of degrees hot. It was easy to imagine a catastrophic failure in any number of the components that made up an SSME. It wasn't a hypothetical worry. Astronauts had been briefed on many SSME test stand failures and explosions. Of course for the first 2 minutes of ascent our lives had been attached to the two booster rockets but we hadn't given them a second thought. No engineer had ever come to an astronaut meeting to explain away an SRB failure. The boosters were the essence of simplicity…just big steel tubes filled with solid propellant. They always worked. None of us aboard Discovery would know it until after the Challenger disaster but one of our boosters had betrayed us. At some point in its burn, one of the flexible O-rings that sealed the segmented joints of the SRB had failed to make that seal. For the briefest of moments…probably just a fraction of a second….5000 F gas, at a pressure of nearly 1000 psi, had wiggled past a primary O-ring and been stopped by the backup O-ring. We had experienced what engineers would ultimately call the first case of “blow by.” We had narrowly missed the same death that would claim Challenger and her crew in 1986. As it turned out, we weren't the only crew to have dodged the O-ring bullet. When the next several flights flew without O-ring anomalies, the correctness of the decision to continue operations was reinforced. Over the following several years, however, more cases of O-ring sealing problems were observed in the returned SRBs but with each successful flight there was a false feedback that it was safe to continue flight operations. In other words, the absence of something bad happening was being falsely interpreted as an indication that the team's actions were safe when, in fact, it was mere random chance that a disaster hadn't occurred. The team had “gotten away with it” so many times, the O-ring deviance had been normalized into its decision-making process. This, in spite of the fact that some SRB engineers were predicting disaster, as in these words written by a contractor engineer six months prior to the Challenger tragedy, “It is my honest and very real fear that if we do not take immediate action…to solve the problem with the field joint (the O-ring) having the number one priority, then we stand in jeopardy of losing a flight along with all the launch pad facilities.” Even warnings such as this could not reverse the normalization of deviance that was occurring. On January 28, 1986, in bitterly cold temperatures that had stiffened the O-rings and compromised their ability to form a pressure seal, both the primary and backup O-rings on the bottom segment joint of the right side SRB catastrophically failed at ignition. Seventy-three seconds into flight the vehicle was destroyed and the seven member crew was killed. While many people refer to Challenger as an accident, it was not. Challenger was a “predictable surprise” precipitated by a multi-year normalization of deviance. Every team and every team member is vulnerable to a normalization of deviance in their operations. When was the last time you took a break to see if you are infected? Are pressures (schedule, budget, family distractions, etc.) causing you or people within your organization to cut corners in safety or other areas? Are they oblivious to the deviance of their actions because they have gotten away with it so many times in the past? Have they fallen into the trap of believing the absence of disaster means their actions have to be safe? It's time for a “normalization of deviance” check. By line: Astronaut Mike Mullane is a veteran of three space shuttle missions. His recently published memoir, Riding Rockets, The Outrageous Tales of a Space Shuttle Astronaut (Scribner), deals significantly with his time at NASA and the Challenger disaster. Copyright 2007 by Mike Mullane. This article cannot be reprinted in other publications without the written permission of the author.